Yes, colon discomfort. But you’d be wrong to think that my recent long-haul flight back to New Zealand – with its dubious chicken or beef options – was the cause. We’re talking pure punctuation here. As an English teacher and wannabe writer, I pride myself on my mastery of punctuation. 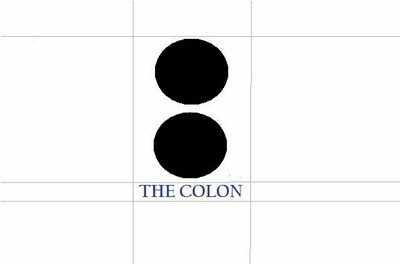 I am intimately acquainted with the semicolon. I grasp the awesome power of starting a new paragraph. I fell in love with – and married – a man who knew how to talk to me about apostrophes. I quietly scorn writers with idiosyncratic capitalization and those who can’t punctuate the difference between a defining and a non-defining relative clause. Weren’t they paying attention in high school? Yet I’ve been able to move on from high school too. I’ve long dropped the double space after a period taught to me in tenth-grade typing class, a vestige – as I am – from the typewriter days. I’ve kept up with more efficient changes in punctuation by dropping the unnecessary comma after “and” when listing names, countries and grocery items – this last phrase being an example. OK, so I do indulge in an overuse of hyphens – they’re just so beautiful – but otherwise, I’m perfect. So what was National Geographic doing undermining the subtle role of the colon? As a lifelong reader of the magazine, I felt betrayed. With such a worldwide reputation, I thought, millions will copy their editors’ tainted use of the colon. Shouldn’t they be more responsible? How can they work for the protection of the planet but not defend the colon? Will the colon someday be extinct? When I landed in the States this September, I was horrified to see the virus had already spread, so much so that it seemed National Geographical might not have been the perpetrator but simply another casualty. There was The Smithsonian…The New Yorker! Everywhere I looked, there was colon abuse. But my horror soon turned to discomfort. Was it them or was it me? Had I missed a modern punctuation trend? Despite my efforts, have I now become as old-fashioned as the generation of double spacers and comma overkillers?